In many developing countries, hypothyroidism has become a serious, yet an under-diagnosed condition. It is essentially an abnormality of the endocrine system, which is caused by inadequate thyroid hormone production, resulting in a number of disorders and health issues. Thyroid hormones are important to regulate our body’s metabolic processes. People who suffer hypothyroidism tend to have very slow metabolism rate. The abnormal metabolic rate can bring about plenty of health disorders ranging from a very mild symptom to life-threatening complications. The mild and subtle symptoms associated with this condition include muscular cramps, stiffness of joints, pale skin, dry hair, weight gain, physical exhaustion, intolerance to temperature swings and drowsiness. Fatal complications may develop slowly started from memory loss, mental sluggishness, visual problems, serious depression, unconsciousness, coma and death. This condition can be very dangerous if the patients fail to be diagnosed and treated properly. People with hypothyroidism are unable to produce enough thyroid hormones, such as triiodothyronine (T3) and thyroxine (T4). This condition can be caused by a number of things. One of the most common reasons of hypothyroidism is the removal of thyroid gland after a surgery. 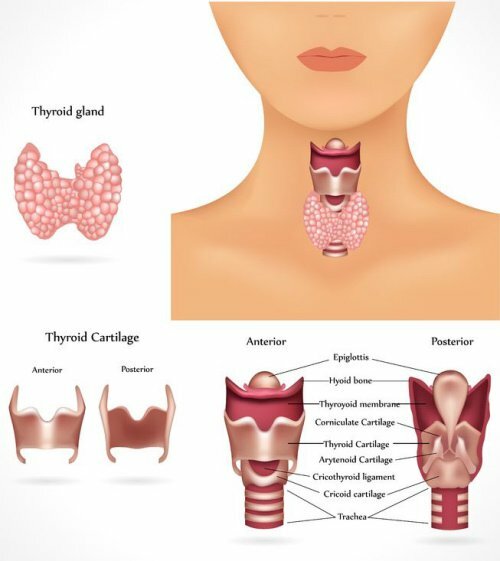 The thyroid gland may need to be removed due to a serious endocrine disorder and the person needs to take thyroid hormone replacement medication. People who have been treated with radioactive iodine at a therapeutic dosage may also suffer hyperthyroidism. This condition can also be caused by impaired pituitary gland, which results in low thyroid-stimulating hormone (TSH) production; consequently, it may significantly reduce the T4 hormone production. Hypoyhyroidism can be diagnosed by medical record, physical examination or blood tests. The most accurate test is blood test that measures the TSH and T4 levels in the blood. Some doctors however, prefer to combination of a detailed review of the medical record and physical examination. 1) You need enough iodine to have a healthy endocrine system. This element in essential for the production of T3 and T4 hormones, which are made by the thyroid. People with inadequate iodine can’t live healthily. Taking iodine-rich foods can effectively solve this problem. Kelp or better known as seaweed is the best natural source of iodine. Kelp-based iodine supplements are available in most drugstores and specialty stores. The suggested dosage is based on your condition, if you have hypothyroidism, your iodine intake should be 25% higher than the recommended daily iodine intake for a healthy person. An iodine supplement is working if you no longer feel tired, no longer gain weight and have far less joint pains. 2) Women are at higher risk for this condition and many researchers believe that it’s caused by the estrogen imbalance. Abnormal estrogen level can affect the thyroid gland performance. There are a number of herbs can help you restore the normal thyroid performance. Vitex agnus-castus and black cohosh are two herbs that can regulate your estrogen production and reduce uncomfortable symptoms of hypothyroidism. Speak with an experienced herbalist to find the suitable dosage for you; however, if your hypothyroidism is not caused by estrogen imbalance, these herbs won’t do you any good. Schedule a visit with your doctor to determine the real cause of your condition. 3) Regardless, of your health condition, healthy diet is still a deciding factor in maintaining a good health. This is especially true on people with hypothyroidism, because when the thyroid can’t do its work properly, the slow rate of metabolism can cause a drastic weight gain. In modern society, low-calorie diet is increasingly hard to maintain, as the result many people are lured to high fat, high calorie foods all the time despite their best efforts. To ward of your appetite, choose high fiber foods (fruits and veggies) as the main component of your daily diet. Snack on seeds and nuts instead of salt-rich potato chips. Avoid coffee and drink plenty of water. After consuming enough high-fiber diet, you’ll feel fuller can resist those high-calorie foods better. Healthy diet can help to improve your metabolism and offset some of the undesirable effects of hypothyroidism. 4) It’s common for people with hypothyroidism to experience dry skin, which is both itchy and irritated. Although the problem may seem to be insignificant, it can greatly affect your life. There a number of ways to relieve this condition, for example oatmeal and aloe vera are two good home remedies to treat dry skin. Calamine lotion may be effective to relief the itchiness but it may aggravate your dry skin. To treat dry skin and itchiness simultaneously, apply oatmeal paste to the affected area and let it sit for half an hour, then rinse. After the skin is dry, apply a fresh aloe vera gel to the recently rinsed area and let the transparent layer to be absorbed on your skin. Repeat this treatment later in the day, if necessary. Hypothyroidism can cause a severe case of dry skin and the combination of oatmeal and aloe vera can help significantly in relieving dry skin and itchiness simultaneously. 5) B vitamins are essential in managing healthy thyroid gland. These vitamins are water-soluble and can work together to enhance your metabolism. By regularly taking foods that are rich in vitamin-B you can boost your metabolism naturally. There are plenty sources of B-complex vitamins, including brewer’s yeast, chili peppers, root vegetables, bananas, fish and whole grains. Because B-12 vitamin is only available on meat, vegans need to regularly take B-12 supplement. 6) Just like healthy diet, regardless of your health condition, exercise is good for both your mind and body. You should exercise 30 minutes a day, for five days a week to boost your degraded metabolism and alleviate depression symptoms. Exercise can help to remove toxins lodged inside your fat layer through sweating, which can take the pressure off your adrenal glands, kidneys and livers. With a healthy thyroid gland, these organs can keep your body functions running smoothly and regulate the impaired metabolism. 7) Waking up in the morning and getting the early sunshine (especially when combined with exercise) are definitely healthy. Sunshine is important to trigger the vitamin D production in your body and the vitamin has an important role in maintaining your immune system. Hashimoto’s thyroid is a common form of hypothyroidism, which is an autoimmune disease that can cause the immune system to attack your own body. The real cause of Hashimopto’s thyroidism is still unknown, but it appears that the patients’ condition is improved when they exercise under early sunshine everyday. Thanks a ton. very informative one.